Sri Lanka Department of Education is preparing to hold the G.C.E. 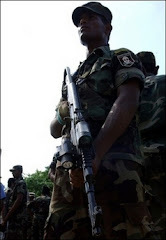 (Ordinary Level) examination in the Eastern Province areas recently captured from the hold of Liberation Tigers of Tamil Ealam (LTTE) fighting for a separate state in northern and eastern parts of the island. Accordingly, three examination centers will be set up in Vakarai, Kadirweli and Mankerni. An evaluation center is also to be set up in Vakarai. An estimated two hundred and sixty students will be taking the examination in Vakarai. The Examination Department did not hold examination centers in these areas last December due to the clashes between the Army and the LTTE there.